Painting and making sculpture was widely in vogue in the Victorian age and hence, Edwin Landseer is quite a known name among all of us. 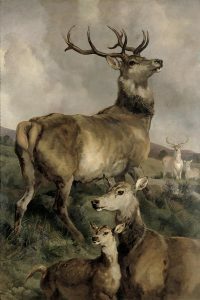 Edwin Landseer was born in London, on March 7 Th in the year 1802. We all find a common link among the Victorian age painters as most of them were from the Royal Academy of arts. He wanted to pursue his passion from his childhood and hence, painting, sculpting and such creative aesthetics were chosen by him from the very beginning of his career. Most of his works belonged to the romantic period. He was a contemporary of the romanticism movement and its products. Ssculpting was there in Edwin Landseer‘s blood as he was born in an engraver’s family. This paved the way for his passion and hence, most of his works were circulated in the form of engravings in the earlier periods. His talents revolved around multiple facets of creativity and he was involved in painting along with making of sculptures and drawings (sketches) of animals. Edwin Landseer specialised in drawing pictures of dogs and horses and portraying animal figures upon his canvas was his forte. In fact, Edwin Landseer is especially known for his drawings of animals as the figures were reflected perfectly upon the paper and none before him did strive to project animal figures in this very manner. Edwin Landseer was a trendsetter as he did start this genre of drawing animal figures and animal portraits. 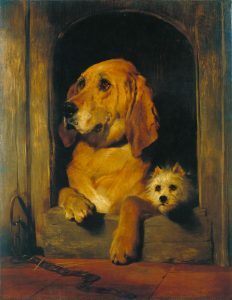 Edwin Landseer was having strong patronage from an aristocratic circle and he also got his support from Sir Walter Scott. His circle and other influential people supporting his art and aesthetics made a huge difference in his world. To model the lions at the base of Nelson’s column in the Trafalgar square is considered one of his colossal achievements in sculpting. Though he had a tiff with the royal family before this colossal achievement owing to the unfinished portrait of the family, he did not let that be a hindrance on his trajectory of success. The irony of his life was a mental break down that was considered to be a nervous disease and this is known to trouble him a lot throughout his life. He had mental breakdowns, frequent melancholy, and periods of depression as well. The portraits of animals that he used to draw were not mere figures upon the canvas but he did strive to mirror social issues, through satire and symbolism. The shrew tamed is one of his famous paintings as well. His career in painting and sculpting made a huge difference in that era as he tried his hands on something new, something really different as well. His paintings were detailed, accurate and his command over hues, contrast and brushes was clearly evident as well. Death: Edwin Landseer died in London in the year 1873 on October 1.